Last Saturday I attended the memorial service for a friend of my oldest son who was killed two weeks ago, and I have not been able to feel right since. In fact, I haven’t felt right since I heard news of his violent death at the age of 21. Because writing is one of the main ways I deal with my feelings, I have been trying to write something all week, but it’s been hard to get it out of me. I suppose there are plenty of things which are confusing to me about this, and I’m sure even more so to others who were much closer to this young man than I. The death of a 21-year-old is just plain hard to understand to begin with, and I didn’t know Everett Williams myself which is partly why it’s confusing. Certainly I have heard about him, and it seems he and my son had recently been spending more time together, perhaps because my son had just moved into an apartment close to where he lived. They were both working on the big project of transitioning into adulthood and becoming who they were truly meant to be. The memorial was only six days out from Everett’s death. I do not know the circumstances of his death, other than that it was violent and sudden, that he was shot, and that possibly some of the people involved were friends or acquaintances. It’s not my place to speculate about it all, and obviously I’ll leave all of that up to the authorities and others involved. What is true is that my heart has been aching, and I have felt troubled and not sure how to work through my fluctuating emotions. I didn’t know Everett, but I know boys. I know boys pretty well actually. I have a 13-year-old son, and a 20-year-old son, and I am surrounded by boys and their boy energy, and their boy love and boy angst. And I am a mother, before anything else, I am a mother. If there was one thing I was meant to be in this life, one role I identify with more than any other, it’s that of mother. So when someone’s child is killed, and that child happens to be good friends with my child, of course it’s not going to be easy. At the memorial, the grief was raw and overwhelming to witness. Maybe I’ve been lucky, but I don’t think I’ve ever been in a room full of that many sad young men. The shock and sadness were tangible and heavy, and there was no way to look away from it all. Some boys were crying through the whole thing, and some were unable to speak as planned because they were too bereft to talk. His parents were lovely and composed. His mother, apparently the daughter of a well known jazz singer and herself a woman with a beautiful voice, sang some songs that she’d sung to Everett and her four other children when they were little. Her family she said, was “chagrined” when she gathered them around the table for bible study in the evenings, but clearly this was part of the glue that held this family together. They were faithful – faithful to their God, and faithful, it seems, to each other. His mother spoke of what a sweet and easy baby he was, following her two oldest children who were not such easy babies. Each one of his siblings spoke through tears, voices choked with grief, each sharing something different and special about their relationship with their brother Everett. I sat there and I watched and listened, and I saw everything and everyone swirling around me in that room as pieces of one giant picture that was maybe too big for me to see in its totality. I saw the love and the anger, and the joy and the sadness. I saw the sacredness of life, the profane nature of violent death, and the resulting shock and fear and bewilderment. I saw the shame and the pride, and I saw the confusion resulting from the struggle to grasp the finality of death, particularly in someone so young. I saw strangers and people I knew, boys and girls who’ve grown into young men and women. I saw sensitive man-children who are trying to be tough and who are trying to make it in a hard world with varying degrees of success. Everett was clearly special to many people. He was a young man who could cross boundaries. Many people mentioned this, as well as his ability and passion for engaging in lively discussions on a wide range of subjects. 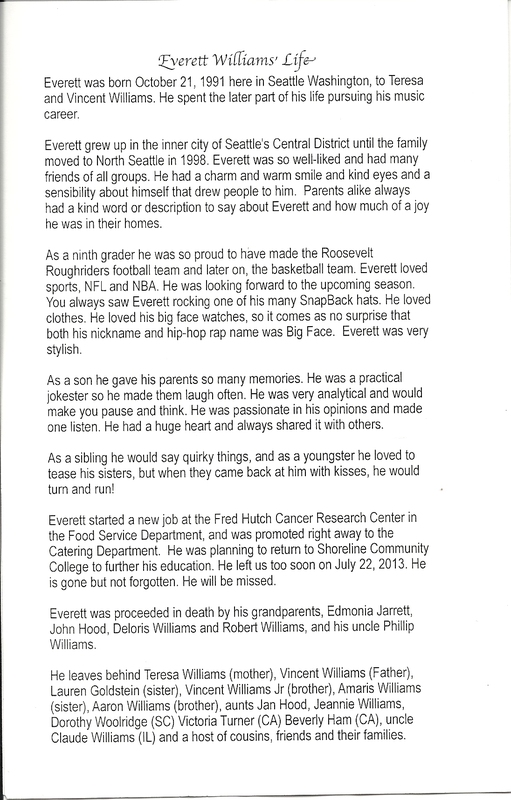 His older brother said that if he was the “rock of the family”, then his younger brother Everett was the “soul of the family”. Because he was a friend of my son and at the same time someone I didn’t know personally, Everett has come alive to me through the memorial and also through my son. My son described him as a person who had a surplus of energy, creative, passionate and funny. A boy whom he called a “crystal child, just like me”. Sensitive and tuned-in to the world in a special way. A friend who taught him to eat bananas peel and all, for extra nutritional benefit. A friend he made music with. A friend who came by his apartment regularly to say hello and talk about all sorts of things. A friend he called a brother. Again, I don’t know what really happened. But I heard his father say at the memorial that it is our job as adults and parents to be there for our young people, and that this is perhaps our most serious and important job. He said that we must take our passion and our gifts and we must use them to support and guide our youth. He IMPLORED the adults in the room to take this seriously, even, he said, if it’s just a “kind word” and he pointed to many people and families in the room who were there for Everett in different ways throughout his life. At the memorial I sat next to Kate Martin, a friend who happens to be a candidate in the race for Mayor of the City of Seattle. Kate is a shining example of a person who has been a ruthless advocate for youth. When my oldest child was a teenager, her house was THE house in the neighborhood where kids were always welcome, and my son and apparently Everett were regulars there at different times in their lives. Kate has two sons and does not separate herself or set herself apart from young people, she participates fully in their lives and concerns, and she doggedly supports them in their difficult, ongoing work of growing up. Each one of my kids are lucky to have had Kate or people like her in their lives who have been like second parents to them. Loving adults who have fed, sheltered, nurtured, loved, chauffeured, mentored, and supported them in different ways throughout their lives. Throughout the week, I had several encounters with people from other areas of my life that were in some way connected to Everett’s life or affected by his death. I acknowledge how connected we are whether we know it or not, whether we want to believe it or not. The names in the newspaper, on the eleven o’clock news, the names of the dead, the perpetrators, the victims, the helpers – we are all linked in one big picture that is sometimes hard to see, but one which will undoubtedly reveal itself to us in time. The more we realize that, and the more we shape our lives according to that realization, the better off we will all be. 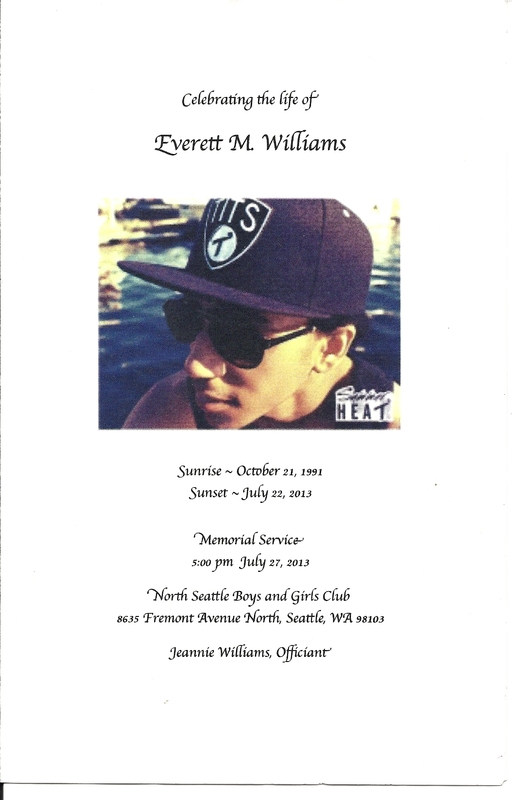 Rest in peace Everett Williams, crystal child. This entry was posted in coming of age, friendship, grieving, love, teenagers and tagged death, Everett Williams, Kate Martin, parenting, teenagers. Bookmark the permalink. Hare Krishna, what else is there to say. Everett’s loss is everyone’s loss. There is no one or no thing we can hold on to in this world. Except God. When I read your first post, about this tragic death, I felt such a sad loss… for us all. Another young man, killed violently, senselessly. I saw the story in the local news… and knew you were all grieving. Like you, I have 2 boys, similar ages to yours. I have “boys,” young men around the house all the time… and this felt so viscerally close, having read your piece. This tribute is beautiful, deeply stirring. I hope his family reads it, as it is truly a tribute to a special life, lost too soon. So sorry for your son’s loss. Reading this makes me grateful my ‘boys’ are in their thirties, grown and somewhat grown up. It is impossible to know how to express sympathy in the face of young life lost violently. It is terrible, wasteful and horrific; for everyone. Thankfully, there are adults with empathy, compassion and wisdom who can see all these young people through, hopefully keeping them whole and strong. Again, I am so sorry for everyone involved. These ripples through your lives are terrible. Such a tragedy — and such a beautiful post about Everett. I am so sad to read about his loss, and almost unimaginably full of grief for his parents. My mind literally will not go to the place where I can imagine the death of my child … but in terms of our society, we are losing FAR too many of our young boys. Our young men. I cannot stand to think about this, and yet we have to — it’s our family. It’s our sons. We have to think about this! Thank you for letting us know about Everett. I wish he could have grown into a crystal man. I want to say Thank You to you! This post was truly inspirational. I grew up with Everett since I was in middle school, and knew him from then on. I too have been trying to put words, or get a grasp on my emotions since Everett’s “sunset” as you call it (which I love by the way). I have had a handful of friends pass away in the past two years, all under the age of 21, each one of them leaving me speechless as to how and why this happened. The one thing out of each of the different situations, whether it be murder, sickness, or a freak accident, each one of these people has made, and will continue to make a lasting impact on their surrounding, and even a larger community. The one thing that I cherish most about friends such as Everett, who have passed away, is that we are all able to look back on our time spent with him, and have so many amazing, fun, and inspirational stories to share. Continue to spread his name, continue to share his stories, that is what we all must do. Thank you for sharing yours! We’re losing too many of our children, our future, to gun violence. I’m sure, as a mother, at some point, you say to yourself, “Could this have been my boy? Could it have been him in a casket, instead of this crystal child?” And the answer is yes. I don’t even have children, but we need to protect our country’s youth. From gun violence. From bullying. From hard drugs. From gang influence. From crime. From poverty. From war. This lovely young man represents just one of so many promising lives that have been cut short this year already. When and how do we stop this madness? Beautiful post. I’m so sorry for your son’s loss and for Everett’s family’s loss. Thank you for the comments. It is so sad, and the gun violence in our youth is a sad reflection on our society, and one which affects all of us, whether parents or not. This made me cry all over again. I was in New Orleans when I heard the awful news and couldn’t make it to the memorial. I always thought of Everett as a little brother. I hung out with him on a daily basis in 2008 and 2009. He was so young. Theres so much he will never do or see. The idolization of “gangsterism” and “being savage” in the Seattle youth culture needs to stop. I’ve seen way too many lives ruined by it. I came across this post today and I was so taken by what was written. First, I want to say thank to the writer and to everyone that has commented. Whether you knew my son or not, your genuine care and expressions are heart felt. As parents, I know that many of you can relate to how much children can love, delight, challenge and even grieve your heart. But our unconditional love always overrides any heart harm. So, thank you folks. The author so poignantly describes the emotion of that day. My head was swirling around. My emotions shredded. Indescribable pain, shock, disbelief, anger, so many more emotions to describe. The Courage of his mom, his brothers and sisters, friends and family and the community to come together in all the grief, dismay, anger, rage, hurt, was something to behold. I cannot fully express here what that meant to me and the family. The Greenwood Boys and Girls Club family, is Family. To open up their home to our family, especially during that time for one of their own was such a blessing to our family. We are indebted. To hear such thoughts for this young man blesses my soul. No one is perfect. Everett was not perfect. He was a young man discovering who he would become. We will never know his full potential. That is one thing that is so very difficult to wrap my head around. I feel so bad for him. He had so many promising things going. For him to be robbed of that so angers me. I so wanted to continue to help him cultivate his gifts as I now do his brothers, sisters and friends. So many conversations I would love to have with him. So many things that I would to say. I am holding back my tears right now as I think about it. Damn it. Hug, call, text, visit, your kids, parents and BF today, tell them how important they are and how much you love and appreciate them, folks. You never know what you last word will be. For the family, it has been difficult, to this day. I know we all have our moments. If you have ever lost a parent, friend or a child then you know what I am talking about. Lightening has struck twice in our family as my second oldest brother’s son was murdered at the same age, back in 1993 or4. We have been through this before but this was my son. My heart, “Rock” named by his Grand Mother, the late Edmonia Jarrett. Even to this day, I still cannot believe he is gone. It seems like all just a bad dream, but we can’t wake up. The moment that his mom and I found out he was dead and the moment that we had to tell the family replays in my mind like a loop. I can’t shut it off. The anguish, the heart break, the sheer pain, I cannot even describe how that ripped at and continues to rip at the very core of our being. There were so many murders last year in Seattle. So many families going through the same pain and grief. Madness folks. I wrote an article about it all that I have yet to have published. Some day soon, I will. I have never heard “Crystal Child.” Awesome! Whenever I read something posted about Everett, I always come away finding something else interesting about him, so thank you so much for that. Thanks for your lovely note Mr. Williams. I read what I wrote all over again, as well as the comments and cried my eyes out all over again. My son has struggled hard with Everett’s death, and misses him a lot. I hope you will publish the piece that you wrote. Much love to you and your family.